Since the age of 16, Frazetta drew for comic books that varied in themes: westerns, fantasies, mysteries, and histories. During the 60s, he then went on to produce paintings for paperback editions of adventure books, such as the cover for the sword-and-sorcery collection Conan the Adventurer by Robert E. Howard and L. Sprague de Camp (Lancer 1966), which saw the artist rise to fame. With his work in high demand, Frazetta chose projects that were more commercial in nature, providing paintings and illustrations for everything from movie posters to book jackets to calendars. Admired by many Hollywood personalities, he was even commissioned for some film work by Clint Eastwood and George Lucas, among others. Most recently, his artwork has been used for several album covers: Molly Hatchet‘s first 2 records feature “The Death Dealer” and “Dark Kingdom” respectively; Nazareth used “The Brain” for 1977′s Expect No Mercy; Wolfmother put “The Sea Witch” on their self-titled debut. 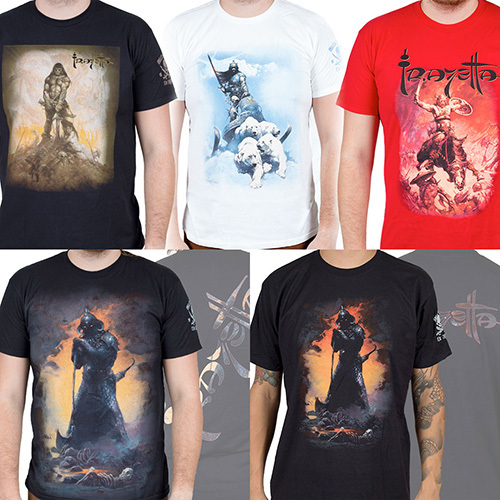 Now, due to a special partnership with Metal Blade Records, Frazetta fans can wear some of their favorite designs (with more merchandise coming soon! ).